At Viera East Veterinary Center, we have spent decades educating pet owners about proper dog nutrition for dogs of all ages, breeds, conditions and lifestyles. Because canine nutrition ultimately plays a large part in the quality of your dog's life, we want to share some veterinary insight with you about proper dog nutrition, whether you are looking for puppy food recommendations, or adult and senior dog nutrition advice. 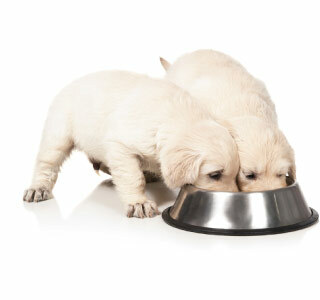 Puppy food is best given in multiple, well-spaced meals 2-3 times daily. In general, all puppies under 10 pounds should be fed 3 times a day and those above can be slowly weaned to twice a day feedings. Feeding on a schedule will also help to get their bodies in a routine which will help with house training. Some breeds will overeat if allowed access to too many calories, so it is best to monitor their weight gain and ask your veterinarian to help determine if the growth rate is correct or if your puppy is growing too quickly and/or gaining too much weight. You should feed a puppy food that contains 25% to 30% protein. Remember, the adult size of a dog is determined genetically, not by how fast he or she grows. So refrain from overfeeding puppy food in an attempt to accelerate a puppy's growth rate. Each dog is unique and therefore there is no one dog food which works for all dogs. In general, feeding a premium brand such as Hill's Science Diet is a safe bet for all dogs. They have many choices of proteins and types of diets (canned, dry). There are several premium brands of dog food that are good choices. We know that most of you like to feed your dog some of your food. If you are like most people and want to add some whole fresh food to your dog's diet, we recommend that you add one ingredient at a time to see if there are any digestibility or intolerances. Adding some fresh cooked vegetables and some healthy low fat protein to your dog's kibble can actually be a very healthy addition. Cooked broccoli and green beans are generally well tolerated by most dogs. Chicken, fish and lean pork or beef can also be added in small amounts to your dog's food. Adding in some other protein sources is only ok in dogs who are not allergic. Always review your diet plan with your veterinarian. In general, feeding a high quality kibble and adding some whole food can be a very healthy diet for your dog. We generally recommend that you keep the amounts to 20-25% addition of table food to 80% dog food. Since 1996, our veterinarians and veterinary support staff have helped educate and guide tens of thousands of dog owners to better understand and implement proper canine nutrition regimens. We love helping owners learn, and especially love seeing the positive effects of dog nutrition in the bodies and minds of the many furry, four-legged patients we view as our extended family members. If you would like to discuss canine nutrition with our veterinary staff, please contact us to schedule an appointment!